Look at MadDog teaching people how to embed tweets. *sniffle* They grow up so fast! 52 years and counting. fvck off Toronto. I mean...yea...but fvck the Hurricanes. If it was another team I'd be happy for them shattering expectations but they're the Hurricanes. fvck the Hurricanes. fvck Erik Staal and fvck Niclas Walen and fvck Arturs Irbe too, wherever they are. According to Masisak of the athletic, if Boston loses to CBJ, the Devils would have picks #1, #34, #54 and #55. Options range from: 1. Taking 4 of the top 55 prospects in one draft class 2. Trading one or two picks for a current NHl'er 3. Trading two picks to move up into the mid-late first round after picking at #1 Not too shabby. I think it's hilarious that Toronto is already in a position where they need to start making Chicago Blackhawks style cap casualty decisions despite this group never having won a round in the playoffs. I guess the problem with pumping these guys tires so much before they achieve anything is that they're going to expect to be paid like it. Matthews is great and all but he also has a career high of 73 points. No reason to be paying Connor McDavid money for that. Don't get me started on the Nylander contract. At this point Marner can legitimately walk in and ask for Matthews money this summer, can't he? I would say more but I was adjusting for wing vs center. Wow watching Hughes live for the first time...this kid is phenomenal in so many ways. His composure with the puck, stick handling, passing, everything...by far the best player on either side. DAMN! That puck left his stick in a hurry with just a slight flick of the wrist by Hughes!! Hughes assist just tied Phil Kessel’s record of 16 points for the tournament. In one less game. What a difference winning the #1 pick makes. The talk earlier was about Byram, Cozens, Zegras, and others... Now the focus has shifted to Pick #34 of the 2nd round since the first round has been taken care of. Love it! I think most of us around here blame Bernier more than the refs for that one. We still lost the damn cup because of those two ot games at home. If we could have finished our chances we would have left with a 2-0 series lead. It would have been wild for us to force a game 7 after being down 3-0 in the series but it was rather unrealistic. All these playoff games makes miss the playoffs so much. The atmosphere in all the arenas have been great. BTW Toronto deserved to lose their series for having one of the worst goal songs ever this year. It was Bernier. I still wanna punch him in the face. Vegas had 3-1 series lead Had a 3-0 3rd period lead Had an opportunity to kill the penalty Au Revoir! For the last 4 years I’ve been hearing about this impending dynasty coming out of Toronto. At what point can I reasonably expect them to just win a playoff series? Nope, all the players wives/girlfriends basically look exactly like that. 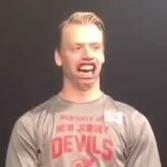 Even for Taylor Hall who looks like a human pug. Last prospects update of the year: https://www.allaboutthejersey.com/2019/4/23/18511813/new-jersey-devils-prospect-update-4-23-19 Last week's too since I think I forgot to post it: https://www.allaboutthejersey.com/2019/4/16/18311242/new-jersey-devils-prospect-update-4-16-19 Many thanks to Brian Franken for writing these (Feisty)! You'd think being in Jersey, he'd find himself a nice brunette Italian or Latina girl with some meat on her bones who could cook him some Sunday pranzo or rice and beans, but I guess those good ol' Canadian boys have a certain type! All I could think about watching that goal waved off was Game 3 in LA in the 2012 SCF when Marty had the puck under his pad for a couple of seconds and the King pushed him in the net and they counted the goal. I think Hughes is playing in the Mens Worlds as well. You don’t need to know obnoxious Ranger fans in order to dislike them. They are our prime competitors in every dimension of the game and market. Having that understanding and dislike isn’t location dependent. https://www.blick.ch/sport/eishockey/nhl/100-fragen-an-100-punkte-hischier-werde-panisch-wenn-ich-das-ladekabel-vergesse-id15270085.html 100 questions with Nico (I copied and pasted the English translation): 1. How many points will you score in the next two years? Hischier: Another 100 for sure. 2. When will you fly back to Switzerland? In the next few days. 3. Where will you go first after landing? Home to Valais. 4. Who is going to pick you up at the airport? I don't know yet. Probably my mother. 5. What do you miss about Switzerland overseas? Friends and family. 6. What do you miss about New Jersey in Switzerland? Playing hockey. 7. Your team has the first draft pick again. Are you sad there's going to be another nr.1 pick on the team? Not at all. I'm happy that we're getting another big talent. That's good for our team. 8. What do you advise the new colleague to do? He should enjoy it. There will be plenty to do for him, but it is a great experience. 9. Your most beautiful goal in the last 2 years? My overtime goal in December against Las Vegas. 10. Your best assist? Last season against Columbus when I set up Taylor Hall. 11. The best save against you? Last season against Tampa Bay, Peter Budaj was incredible. It would have been my first NHL goal. 12. Who's your best teammate? Taylor Hall. 13. Which teammate gave you the best advice? Andy Greene. 14. What did he say? That there are no bad days in the NHL. 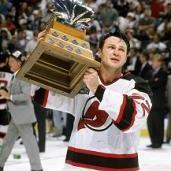 15. Who's the toughest player to play against in the NHL? Dustin Byfuglien. 16. Who's most unfair player in the NHL? I never had anything to do with him but I've heard a lot about Brad Marchand. Fortunately, he has never licked me. 17. From whom would you like to learn something? Connor McDavid. 18. What? I'd like to have his speed and some of his technique. 19. What does the National Team mean to you? A lot. It's a great honor to play for Switzerland. 20. Which players do you already know? Most of them, from the Prospect Camps in summer. 21. How often do you hear from Coach Fischer? Usually once per season when he's on his North America trip. 22. What are your goals for the World Championships? Do my best. Help the team. 23. Last year Switzerland won Silver at the World Championships. Do you feel pressure? No. There are expectations but they can also inspire you. 24. What does Slovakia remind you of? I was there for the Junior World Championships and the Hlinka Tournament. They are good memories. Good stadiums! 25. Toughest group opponent at the World Championships? Sweden. 26. Which team is going to win the Swiss championship? SCB. 27. Who's your toughest critic? Coach John Hynes. 28. When will you sign your next contract? Unclear. Theoretically, it's possible this summer. 29. Which athlete do you admire? Roger Federer. 30. Are you going to watch the NHL playoffs? Some highlights maybe. 31. No full games? No. That would too much. I'd rather be playing myself. 32. How has your Valais dialect changed abroad? Not too much I hope. Soon we'll find out whether they still understand me at home. 33. How's your English after two years in New Jersey? It's getting better and better. I can communicate with everyone. 34. The highlight of the last two years? The games in Switzerland and Sweden with New Jersey. 35. The low point? Now. Because we're not in the playoffs. 36. Best Stadium in the NHL? T-Mobile Arena in Las Vegas. Great atmosphere, great place to play. 37. Worst Stadium in the NHL? Where it has few spectators: Florida. 38. Your toughest road trip? Last season in California. We were in the playoff race and had to play against strong teams. 39. Your best Road Trip? The same one: We won a lot. 40. The coldest place in the NHL? Edmonton. 41. Your favorite city in North America? Vancouver is beautiful. 42. The least beautiful city in North America? St. Louis. It's probably unfair, but the city was like deserted when I was there. 43. What can't be missing on a road trip? The iPad. 44. Do you panic when you forget your charging cable? Yes. 45. Do you still play "Fortnite"? Yes. 46. Which one of your ex-SCB colleagues Burren and Heim is better? I haven't played with them in a while. Ändu Heim is the best gamer amongst us. 47. Best NHL tradition missing in Switzerland? The rookie party. Whereby, there's one in Switzerland, too but nothing else comes to mind. 48. What could the NHL learn from Switzerland? Fewer games in the regular season. 49. Best question you've been asked this season? I don't know. 50. Weirdest question you've been asked this season? I don't know. 51. You became assistant captain this season. What does the "A" mean to you? A great honor. 52. What's so special about it? It shows the confidence the Coaches have in me. 53. Has the letter changed anything? No. I am not treated differently. 54. How did you find out about the "A"? I came into the locker room and the letter was on my jersey. As simple as that. 55. If you say "A"... you must also say "C"? I don't know about that. Maybe someday. I certainly wouldn't say no. 56. Do you want to captain the National Team now? Same here. I wouldn't say no. But let's be honest, these are my first World Championships. The Coaches probably won't consider me. 57. Who's the best Captain you ever had? Two: Andy Greene in New Jersey and Martin Plüss in Bern. 58. Speaking of Captains: Would you rather do the boat license or the flight license? Boat license. 59. Do you have the US car license? Yes. 60. Which car do you drive? A Mercedes. 61. With which piece of music do you listen to get pumped for a game? That depends. 62. Genre? Usually Rap. 63. Are you healthy? Yes. 64. Not banged up after the long season? Not at the moment. 65. Since when are you pain free? Since I'm back from my injury. 66. More than half of this stress interview accomplished: What else is stressing you? At the moment I'm leaving my apartment. I'm moving to another apartment next season. There's a lot to do, that's a bit stressful for me. 67. What do you do against stress? I listen to music. That distracts me. 68. What do you eat if you want to treat yourself to something? A burger. 69. Where will you be training this summer? In Bern. 70. In which areas do you need to improve? Physically, above all. And technically. 71. New York or New Jersey? New Jersey. 72. If the draft was this year: Pettersson or Hischier? I think I now know the weirdest question of the year. 73. Raclette or Hischier-Sandwich? Raclette. 74. Owetschkin or Crosby? Crosby. 75. Shorthander or Powerplay Goal? Powerplay goal. 76. Penalty or Powerplay? Penalty. 77. How often do you practice backhand shots? Every day. 78. Which celebrity from New Jersey comes to your mind first? Martin Brodeur. 79. Mets or Yankees? I don't care about baseball. 80. Then football: Giants or Jets? Jets. 81. Do you play golf? Yes. 82. Which handicap? 36. 83. Left or Right? Right. 84. When was the last time you went skiing? 6 years ago. 85. Ski or Snowboard? Snowboard. 86. What is a hockey professional not allowed to do? Going on the ski slope. 87. Are you interested in politics? No. 88. When will you buy the FC Sion? That isn't planned at the moment. 89. Would you then keep Christian Constantin? That's another candidate for the weirdest question. 90. Pirmin Zurbriggen or Roland Collombin? Zurbriggen. 91. Gold at the World Championships or Stanley Cup? Stanley Cup. 92. Matterhorn or Gurten? Matterhorn. 93. Sopranos or Boardwalk Empire? Never heard. 94. Devil or Angel? Devil. 95. Book or tablet? Tablet. 96. Have you ever jumped off a 10-meter board? Yes. 97. Boxing or UFC? Boxing. 98. Dog or cat? Dog. 99. What can you do better than Wayne Gretzky? Nothing. 100. When was the last time you had a 100 Swiss Francs bank note in your hand? Last summer. fvck Carolina, their fans are horrendous too. I was down there in 06 when they eliminated us. fvcking hope Washington beats them still. Brooks definitely doesn’t hesitate to shred that team (which also caters to the NY fan, as they’ll do the same, often too much). Brooks usually harps on ice time for certain players as his main sticking point. I wish Valiquette could give up 10 goals every game. Someone really needs to remind him that his Ranger career amounted to 39 GP, 27 starts, and 14 wins. Dude, you were barely a footnote in Blowshirt history...stop carrying yourself like your jersey number is overdue for a rafter hanging. fvcking douchenozzle. Hughes just picked up an assist on Turcotte's goal, 6-1 USA right now in that game. This hasn't been Jack's best game, but there have still been a few instances where he looks dangerous with his hands and skating. IIHF U-18 World Championship USA vs. Sweden is on NHL Network at 1:30 PM today. Lets see what Hughes can do! I'd imagine this is an important tournament for these kids. Last shot at gold for a group that his heralded as one of the best U.S U-18 teams ever. He’s to OT goals what Hall is to #1 picks. In general, it’s a decent song.... it’s a HORRIBLE goal song though. Whoever picked it is a fvcking dipsh&#33;t.
This pretty much sums up my feelings on the whole thing. Sure, wasn’t the best call in the world, but FOUR FRIGGIN’ PP GOALS? And it’s not like the GKs were clinging to a one-goal lead. Ya gotta do better than that. I understood that call at the time and thought it was fair. Yeah I was furious too. And I thought, as far as Bernier went, that it was a “fireable” offense. I didn’t think he should be back on the Devils the following season, it was that bad. I like the Sharks, a lot even, but that 5 minute penalty was an awful call. I can only empathize and think back at how that 5 minute PP vs. LA Kings changed the momentum around entirely and lost us that series. Absolute sports history if the Sharks can close this out. I would pick that smokeshow over a “Latina girl with meat on her bones” any day of the week and twice on Sunday. Chances are this girl is his type, lol. MoJo with a goal in game 7. I'm definitely more mad at the Devils. But I can't help but hate Carolina because of it. Their bullsh&#33;t game 6 win with the obvious goaltender interference call. I'm not sure we'll ever agree on anything. 2006 didn't bother me that much. I was too young in 2002. 2009 will haunt me until the day I die. Ray went to scout Mini game a day or two before trade deadline. I think he made an attempt, but couldn't get an acceptable deal. Two major turnovers by Hughes. One led to the goal. The other he caught up to swede and cleanly took the puck off his stick. Hughes skating is amazing not the product of pre draft hype.